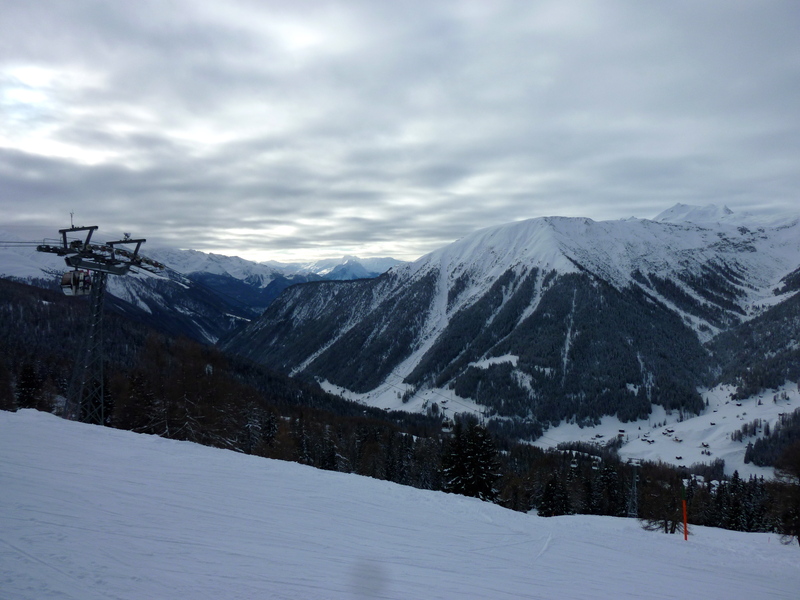 In stark contrast to the rainy and not at all white city we’d left behind, Davos had snow, and lots of it. 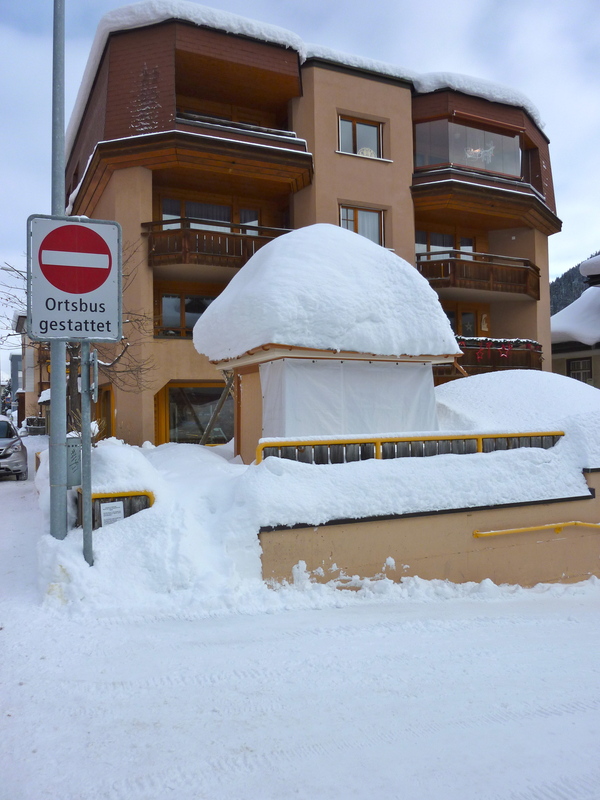 So much snow, in fact, that when we arrived on Christmas Eve, our day’s plans were soon foiled. We were traveling as a group of three couples, and we’d agreed not to ski on this weekend but to sled and hike instead. 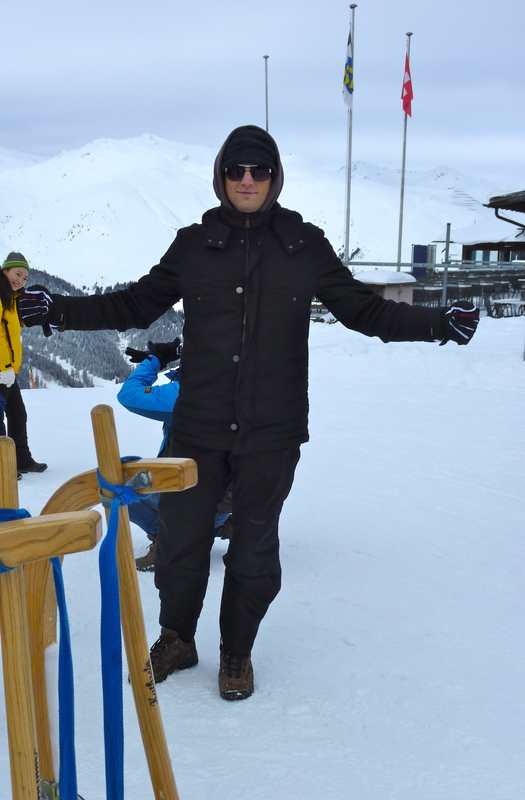 So we headed to Davos’ sledding trail soon after our arrival. I didn’t know this to be possible, but it turns out that when there is too much powdery snow on a not-very-steep sledding trail, your two-railed means of transportation will become ornery and refuse to budge. I’m afraid I wasn’t the most assiduous photo-taker this weekend, mostly because the cold made me unwilling to repeatedly remove my gloves, but one of the two couples we went with posted some great photos on their blog — including one of us looking somewhat dejected as we trudged along the snow-covered sledding track on this first day. But Christmas Eve certainly wasn’t a complete bust. Our sled-walk down the mountain was still scenic and enjoyable, and after we handed our sleds back to the guy who had tried to warn us that “it’s pretty slow today,” we went for a walk along the river, and then took the funicular back up the Schatzalp to have dinner at its panoramic restaurant. And this was perfectly klein aber fein: not only was the food exquisite in taste, but also in presentation — before we dug into them, most of our plates were as fancy and delicate-looking as the hats worn at this spring’s Royal Wedding. (An aside, and my only complaint: it is common in Switzerland to use a type of savory foam in plating at nice restaurants. I find this to be not appetizing, but rather off-putting). Atop the mountain, preparing to sled down. A mountain man enjoying the day. This was an altogether lovely first Swiss Christmas experience, and a great chance to spend time with friends, especially since one of the couples we were with is moving back to Canada tomorrow. I hope your holidays were lovely, too!